Today we tried the different bullets and one different powder. Unless otherwise stated, all loads used CCI #41 primers, oven treated WW + tin, sized 0.245", with HVR lube, and we attempted to load to 2500 fps, and didn't bother experimenting with other velocities. My short term goal is a decent 2500 fps load than I can gradually work up to 2700 fps. A lot of people like to shoot low velocity cast bullets, and that's fine, but it's just not my game, so I'm drawing the line at 2500 fps. -- 10 shots in 9.5" at 100 yards. Yuk. -- 10 shots in 11.8" at 100 yards. -- 10 shots in 10.9" at 100 yards. -- 8 shots in 13.5" at 100 yards. -- 10 shots in 12+" at 100 yards. -- none of the bullets shot decent at 2500 fps. IMHO, if a heavy Loverin doesn't shoot decent, then something is wrong. -- standard deviation was poor with WC844, but seemed to improve as bullet weight increased. Even though the burning rate seems about right for this cartridge, my slippery cast bullets don't seem able to ignite WC844 well. I bet WC844 would work better with jacketed bullets. -- I don't think that WC844's lousy standard deviation is the main cause of the horrible accuracy, but nonetheless I'm going to give up on WC844 in this cartridge. -- Since the Shilen barrel is quite decent, since fouling is not a problem at 2500 fps, since the chamber is snug and concentric, my suspicion is that the throat is to blame for the rotten accuracy at high velocity. Here's the throat impression. Impression diameters tend to err on the small side -- for example, a 0.270" pin gage will fit in the chamber neck, yet the impression of the neck measured 0.2692" - 0.2697". I aimed for a 0.268" neck, but the reamer actually cut 0.2700+". With a 0.245" bullet loaded, the cartridge neck measures 0.2680" - 0.2685", so that's still a decently snug fit and I can live with it. The chamfer between the neck and the leade begins at 0.255" or so, and is 30 degrees per side rather than the usual 45 degrees. The idea was that I wanted a gentle chamfer with a generous entrance diameter, so that a cast bullet could pass through that zone without shaving lead. And it seems to work because I haven't run into leading until 2600 - 2700 fps. The leade is 4 degrees. Why? Because I wanted to err on the steep side, and if the steep leade didn't work, I could always recut it to a more gentle leade angle. Well, the 4 degree leade has not worked well at high velocity, or at least, I'm assuming that the leade is to blame because the barrel is decent and the rest of the chamber is decent and I've tried different types of bullets and different weights of bullets. 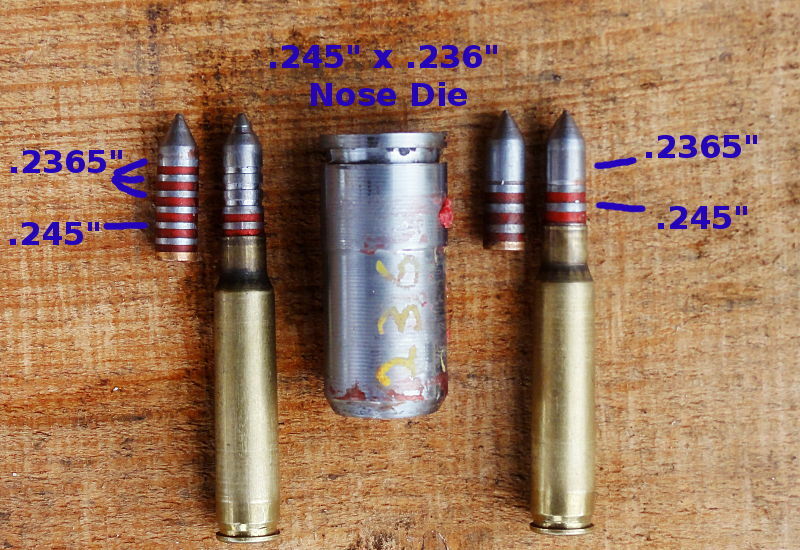 Cast bullets generally don't care for abrupt leads, and it's not surprising that the leade becomes more critical as velocities increase (many BPCR cartridges have abrupt leades, but they're low velocity and generally employ a long bore riding nose that puts at least half the bullet beyond the leade). So far in my experiments I have learned that 4 degrees seems to be too steep (at least at high velocity) and 1/2 degree seems to be too long (in the failed 357 experiment). I don't know which leade angle is ideal for high velocity cast -- that book has not been written yet -- but for now I am inclined to split the difference and recut this leade to 2 degrees per side. I don't know if a 2 degree leade will make a difference -- this is an experiment, it's new territory for me, so I accept that there will be some trial and error, and I deliberately left the barrel the full 28" long so if need be I could set it back and try again. Since the 4 degree throat shot poorly at 2500 fps, I decided to try 2 degrees. I suspect 2 degrees may still be steeper than ideal, but the idea is to start out steep, test it, then re-cut to a gentler angle, and re-test. You can always re-cut a throat longer and gentler, but you can't recut a throat shorter and steeper. 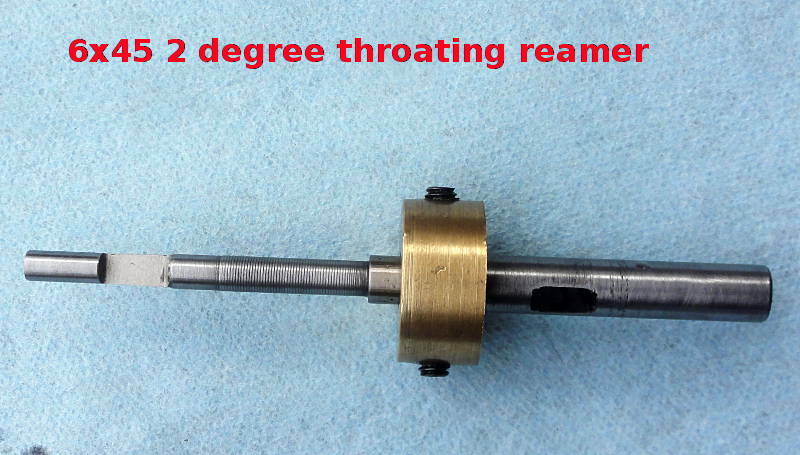 2 degree D-reamer. It cut very easily, no complaints. Throat impressions. I tried my best to keep the throat length the same, but that's easier said than done and it ended up longer. The length is still reasonable though, so I can live with it. On an unrelated note, while I was test fitting the reamer pilot in the muzzle, I noticed that the final 1/2" of the bore was a few tenths bigger than the rest. That's intentional as it comes from the factory and you're supposed to cut the bad section off, but I didn't because I didn't notice the problem until now, and I was trying to keep the barrel as long as possible. I doubt if it makes much difference but I'll eventually cut the bad section off. For now I am leaving it on because I want to do a before-and-after comparison test with the new throat and cutting off the bad section would confound the test. The next step is to shoot the same 2500 fps loads that I shot last time, and see if it shoots any better with the 2 degree throat. Instead of using the same COL's I'll use the same distance-to-rifling. That would seem to be as close as I can come to a true apples-to-apples comparison. After recutting the 4 degree leade to 2 degrees, I retested the same loads that I shot last time. I'm only going to give a very brief summary of the results for reasons that will be obvious. 10 shots at 100 yards unless it says otherwise. -- 68 gr., 7.0" today vs. 9.5" last time. 2543 fps vs 2547 last time. -- 84 gr. bore rider, 10.8" today vs. 13.5" last time. 2501 fps vs. 2475 last time. -- 78 gr. Loverin, 14" today vs. 11.4" last time. 2561 vs. 2507 last time. -- 88 gr. Loverin, 15" today vs. 12+" last time. 2508 fps vs. 2470 last time. So accuracy did not improve with the 2 degree leade. 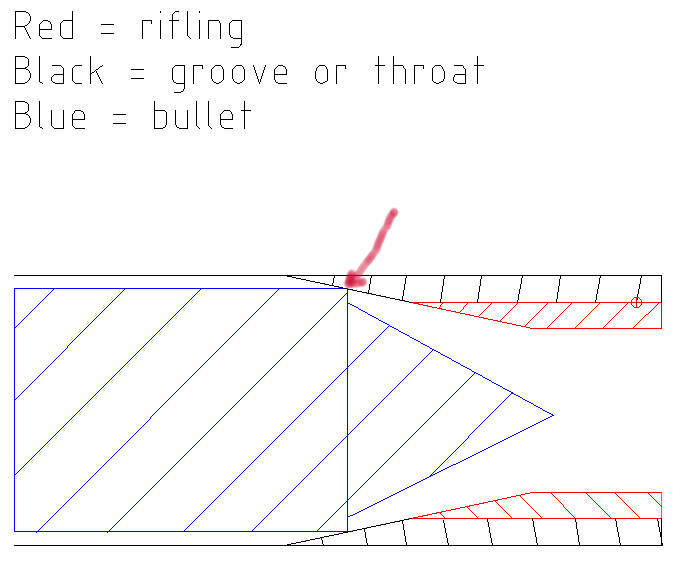 Even though the 2 degree throat pushed the start of the rifling out about 0.070" (see photo of throat impression in previous post), that did not change the COL much. I attempted to adjust the COL to make the jump-to-contact the same as last time, though it's not real precise because some "feel" is required. -- 68 gr. 2.183" COL vs 2.183" last time. -- 78 gr. 2.170" COL vs. 2.151" last time. -- 88 gr. 2.166" COL vs. 2.148" last time. On average, the COL increased only 0.012" even though the beginning of the rifling was 0.070" further out. Why is that? 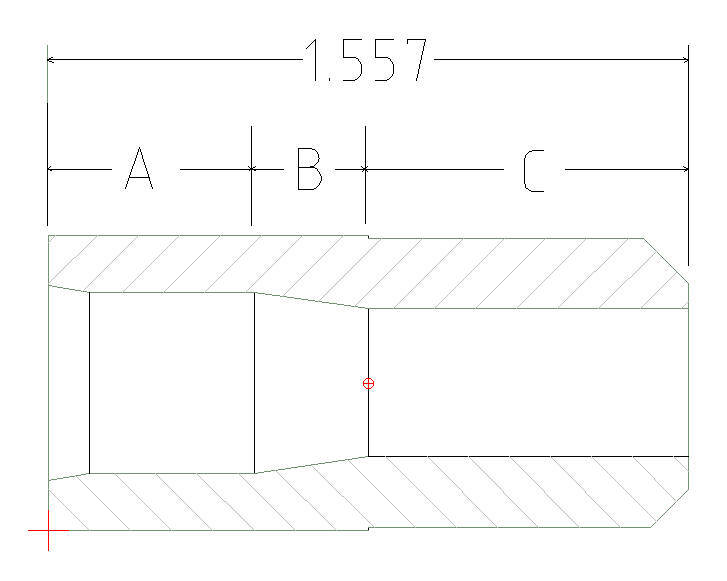 Because the 0.245" front band contacts the unrifled part of the leade, as shown in the drawing below. In fact, with the 2 degree leade the front band has to travel even further to contact the rifling !!! No wonder accuracy did not improve! -- the full diameter Loverin is probably a poor choice. I should either taper it or at least make the front band drop out a little small so that it can reach the rifling. 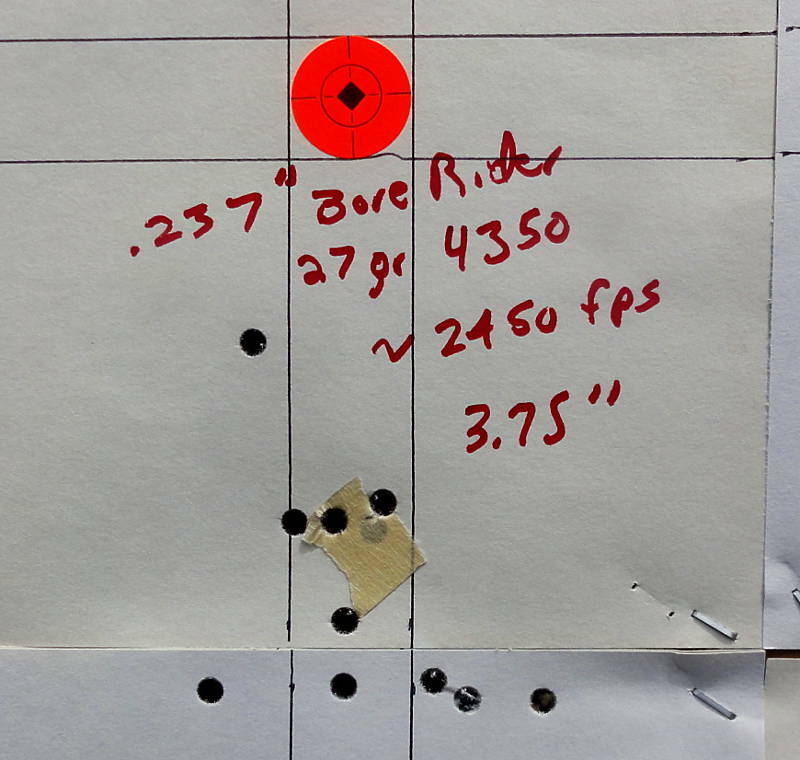 -- when a rifle shoots patterns rather than groups, something is seriously wrong. 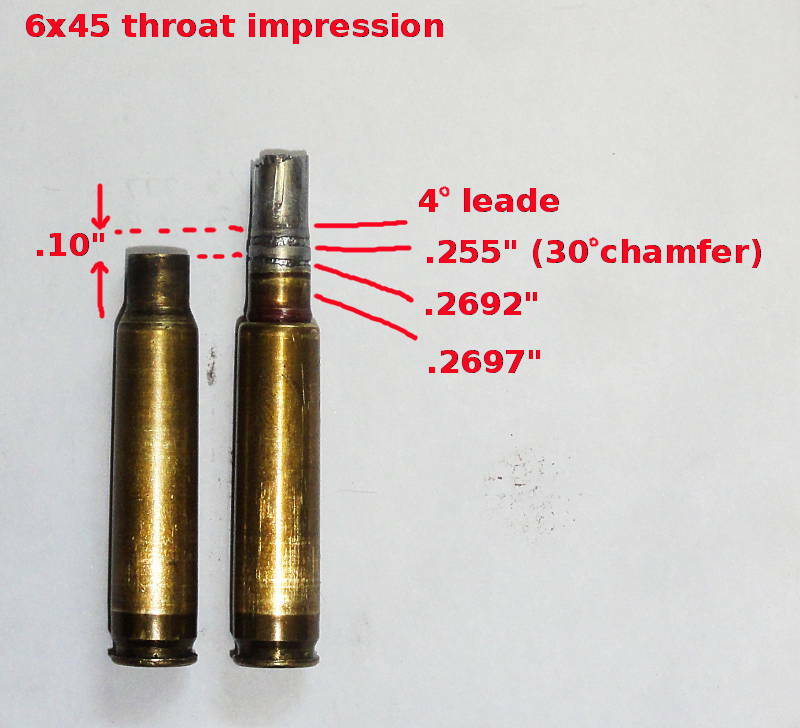 Usually the bullet is being damaged, either due to severe fouling or due to something bad happening in the throat. There was little or no fouling today so I have to assume that something bad is happening in the throat. I have more questions than answers. After testing the 2 degree leade, I put the barrel back in the lathe and cut off the last 1/2" at the muzzle, the part that had a slightly oversize bore. It was only 0.0002" - 0.0003" oversize as best I could measure, so I doubt if was hurting anything. Now the barrel is only 27 1/2" long. -- 8.1" vs. 7.0" last time. 2555 fps vs. 2543 fps last time. So, as expected, cutting off the oversize muzzle did not make a difference. So yes, accuracy improved somewhat as velocity decreased, but it's still below expectations. Any bolt gun from K-mart would probably shoot cast just as well if not better. -- something is wrong, something is damaging the bullet. The trick is to figure out what that something is. -- I now realize my 1-diameter Loverins are not physically able to engrave the rifling when chambered. That is probably part of the problem but I'm not convinced it is the "main" problem. -- I'm not saying the rifle is perfect -- there is always room for improvement -- but the Shilen barrel looks good, the chamber dimensions are good, the neck fit is snug, and a 2 degree leade oughta be a least a "decent" throat. Yet something must be wrong. By process of elimination, all I can think of is something in the throat area. -- come up with a bullet that can lightly engrave the rifling when chambered. There are several ways to do that. -- possibly shoot a few firelapping rounds. Not so much to polish the barrel, which already looks good, but to knock off any burrs or sharp edges in the throat area. -- other than that I am confused, frustrated, and have more questions than answers. There must be something that I am overlooking? Today's goal was to come up with a bullet that could engrave the rifling when chambered. There are several ways to accomplish that but I chose to make a nose die to size the front band down. Then I nose-sized some of the bullets that I already had hardened and lubed. Only moderate effort was required to nose-size the hard bullets. Pic of the 78 grain Loverin after the nose was sized and it was seated so that the front band was lightly engraved. -- 78 gr. Loverin, 17.5 gr. AA5744, seated to engrave, 2568 fps, 17"
-- 78 gr. Loverin, 21.5 gr. WC844, seated to engrave, 2540 fps, 12 1/4"
-- 68 gr. 21.5 gr. WC 844, seated just off rifling, 9 5/8"
As best I could tell with the naked eye, none of today's loads fouled the barrel. I don't think I have ever gotten best results in a Contender with a "jam" fit and today was no exception. Contenders seem to prefer loads that chamber effortlessly. That said, I don't understand why accuracy is so horrible in this chamber? Something must be wrong but I can't seem to figure it out. My Russian borescope is too fat for 6mm so I have no way to inspect the throat other than the throat impression that I posted previously. That throat impression looked decent. At the moment I am out of brilliant ideas, so I may return to playing with my 357 mag barrel while I think about this one. -- make a bore rider with a slip fit nose (my existing bore rider has a 0.237" - 0.2375" nose that engraves very lightly. That would be perfect for a bolt gun but is not practical in a Contender. To be an easy slip fit in the 0.2366"-ish bore, the nose should be 0.236" - 0.2365" . -- if I had to do it over I would try an Ardito throat with perhaps 1 1/2 degree taper. -- try firelapping, with the goal of smoothing the throat (the barrel is already pretty smooth). Today's experiment was to try bullets with a long, slip-fit bore riding nose. The theory was that the long nose would guarantee that the bullet was aligned with the bore when the cartridge was chambered. Rather than cut a new mold and pray that the nose dropped out exactly the right size, it was easier to make a nose die that would size the nose to exactly the right size. Dimensions are from memory so they may not be exact but they're in the ballpark. The tapered section is approximately 2 degrees per side, the same taper as the leade. We end up with a non-engraving glove fit. Contenders don't like to engrave or to jam the leade, so we have to settle for a slip-fit. With the bullets seated 0.007" away from jam, there was only about 0.1" of bullet inside the neck. In effect, this is the next best thing to a breech seated bullet. The resulting 0.2365" nose does not engrave at all when chambered, but it does engrave hard if you try to stick it in the muzzle end. Apparently the bore is slightly bigger at the breech than at the muzzle. That is common and it's OK. It should shoot like a house afire, right? -- two rounds popped the action open, suggesting that 0.007" away from contact was still too snug a fit for the Contender, bearing in mind that there will always be slight variations from one round to the next. -- 2485 fps for 2 shots, the chrono failed to see the other shots. -- several rounds popped the action open, suggesting that 0.007" away from contact is still to snug for the Contender. I've usually had better luck with 0.015" away from contact, but wanted to try something different today. -- barrel was clean to the naked eye, and a tight fitting patch did not show lead. -- the long slip-fit noses did seem to reduce the horizontal dispersion. -- for some reason vertical dispersion was the main problem (it doesn't help when the action pops open). -- I do like using the nose die to produce perfect bore riding noses. It's more reliable and more versatile than depending on a mold to drop out the perfect nose diameter. -- mostly I am still stumped as to why this barrel shoots so poorly at a measly 2500 fps? -- at the end of the day I went ahead and shot five #280 grit firelapping rounds and five #500 grit firelapping rounds. The idea was to knock off any sharp corners or any machining burrs in the throat. -- after the brief firelapping, the barrel had a mirror finish to the naked eye. The barrel had looked good before firelapping, now it looks great. I'm pretty sure the Shilen barrel is not at fault. -- I'll retest some of my previous loads to see if firelapping produces a breakthrough. I've never had much luck with firelapping so I am not getting my hopes up. 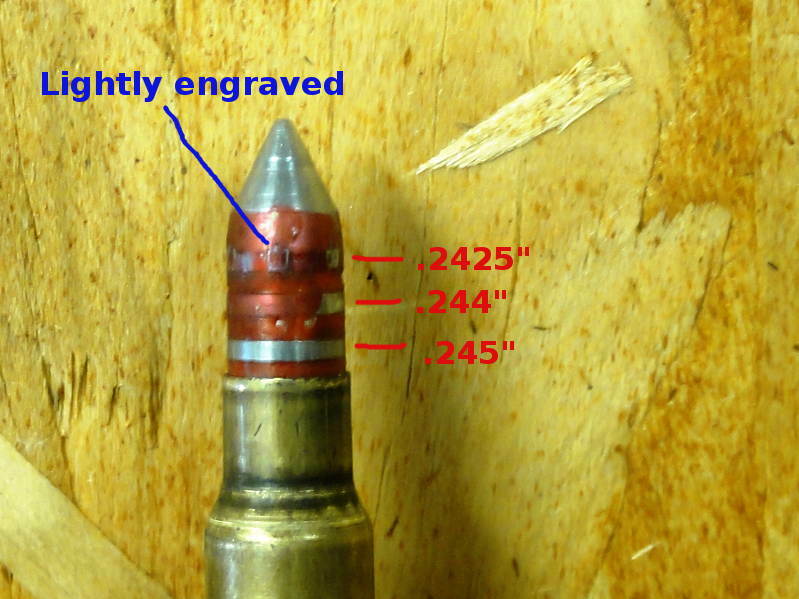 -- I guess I could try a 0.246" bullet instead of 0.245". There's enough room in the neck. 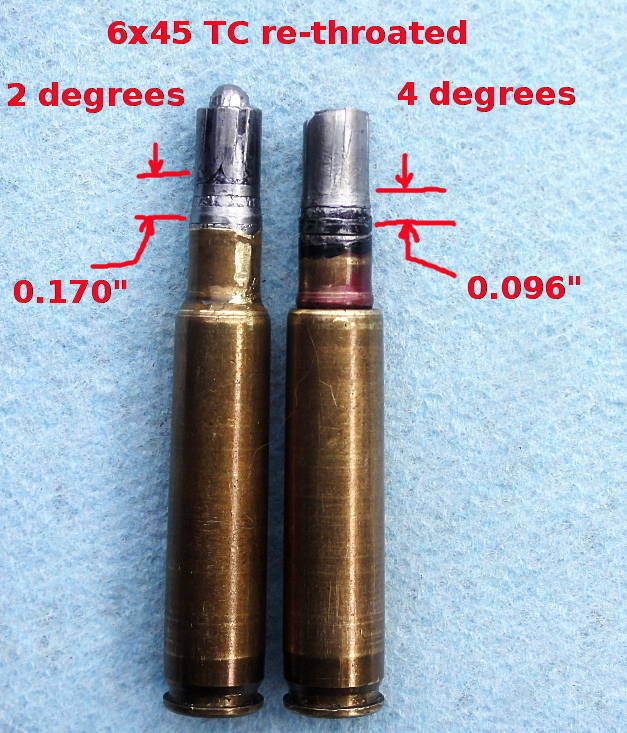 Based on my previous experiences with various rifles, I would not expect a 0.001" change in bullet diameter to make a big difference, but we can try it. -- so far this barrels shoots light bullets as well as anything so the next bullet I make will be a light one, maybe 60 grains. It'll probably be a 1-diameter loverin and then I can always use the nose die to turn it into a bore rider. -- mostly I am still stumped. I've shot a lot of imperfect barrels in my day -- sloppy chambers, rough bores -- and was usually able to coax a decent load out of them. So here we have a nice bore and a snug chamber and yet I can't get it to shoot decent, at least not at 2500 fps. It's a mystery. 3) instead of nose-sizing air-cooled bullets to 0.2365" and then oven treating them, I nose-sized bullets that had already been oven treated. This results in a 0.237" nose because the hard bullet springs back a little bit. The 0.237" nose seems to actually touch the rifling when chambered, though it doesn't engrave per se. I guess you could call it a "touching slip fit," which is probably the best we can hope for in a Contender. -- every single round popped the action open even though they felt like they were chambering easily. -- 10 shots in 3.75" as 100 yards, the best to date for the bore riding bullet. -- standard deviation did not improve with IMR4350. I'm sure IMR4350 is a decent powder so there must be something else going on. -- accuracy was significantly better than yesterday. At least it shot a group instead of a pattern. -- since I changed 3 things at once, I don't know which of the 3 deserves credit for the improvement in accuracy. More testing will be required to sort it out. -- the action popping open is unacceptable. It's potentially dangerous, it causes fliers, and it unnerves the shooter. It must be fixed. -- I dunno if the switch to IMR4350 is responsible for the improved accuracy, but I do know that it failed to improve the standard deviation, and the 27 grain charge was slightly compressed, so I'm inclined to conclude that IMR4350 is too slow for this cartridge. -- right now there is zero daylight between the breech and the frame -- in other words, there is zero headspace. Most Contenders are set up so that there is a few thousandths daylight between breech and frame. So I will put the barrel back in the lathe and shave a few thousandths off the breech. Hopefully that will help the popping-open problem. -- after the headspace is sorted out, retest to sort out which of the 3 things was responsible for the improvement. -- continue to experiment with different powders since IMR4350 seems too slow for this cartridge. -- continue to experiment with the 0.237" nose. If necessary hone the nose die out to 0.237". 1) I shaved 0.005" off the breech of the barrel. 2) I cut the chamber 0.006" deeper to compensate. 4) I adjusted the case sizing die to run the case in deeper until a sized case would seat flush with the breech using only light finger pressure. 5) After doing all that, the action easily closes on a sized case with a metal-to-metal "click" at the end. That's how it should be. 6) After all that, there is still no daylight between the breech and the action, so it's possible that I may need to shave another 0.005" off. But I suspect the main problem all along was the case sizing die not adjusted quite right. Contenders are very touchy about that. That's as far as I got today. The next step will be to retest.